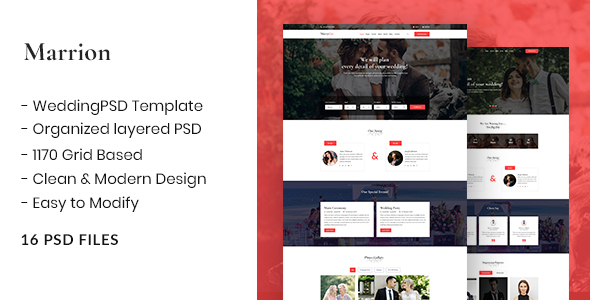 Marrion is a clean and elegant legant and modern design that evaluated a unique & modern PSD template for wedding related websites with clean and trendy design. Includes full functions necessary and researched detail based on experience user. 16 PSD files are well organized and named accordingly so it’s very easy to change any and all of the design. Template files are built to be 1170 grid. Easily customizable widget areas, ready to create the template you desire with the help of our custom widgets. Refine layout adapts to your needs and helps present your content in the most compelling way. You can customize it very easy to fit your business needs. If you like my templates, please rate it 5 stars. It’s very useful for me..